“The film’s premise is that the officially canceled Apollo 18 mission was actually launched in December 1974 but never returned, and as a result the United States has never launched another expedition to the Moon. 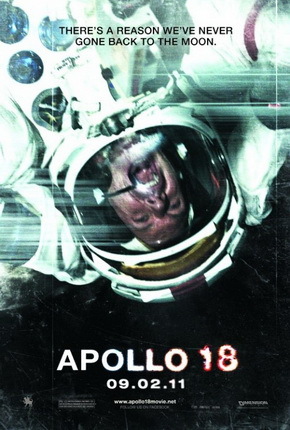 The film is shot in a mockumentary found-footage style, supposedly of the lost footage of the Apollo 18 mission that was only recently discovered. The film is López-Gallego’s first English-language film” (Wikipedia). Verdict: The estimated production budget of Apollo 18 was 5 million US dollars. I think I could’ve done a better job with half a million ringgit. I believe I could’ve gotten more than just 3 actors too. This film is just a very mediocre attempt on producing a space version of Paranormal Activity. Readers, take my advice, avoid Apollo 18 at all cost. What’s the point of … filming a movie in found-footage style when things are circled, zoomed in and replayed in slow motion instead of having them obvious enough to be noticed by the viewers themselves? Realism out the window. What’s admirable: Moon rock spiders, convincing sound effects, and the idea of gaining attention by having a similar title as the popular 1995 Oscars-winning film. Second opinion: “……. Speechless.” (Iris Loong). lol.. 0.5/5.. that's like the worse movie rating ever? oh man, i was planning on watching it later today. was it realy that bad??? i mean i like the trailer thought. it's either this of final destination 5.
ooo, thanks for the heads up. Wont catch this anytime soon. lol! !